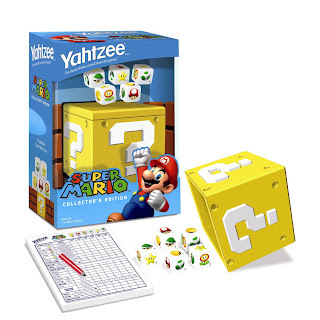 Yahtzee Super Mario Game: $9.99 + Eligible for Free Shipping! Lowest Price Available! If you know a Mario fan, this would make a great gift! Right now on Amazon, you can get the Yahtzee Super Mario game for only $9.99! You can score free shipping on orders of $25 or more, or you can choose to pay $14.95 with shipping included (this can be found on the right sidebar from the POPmart Store). I did some price checking, and the next lowest price I was able to find was $14.96 at Ty's ToyBox and $14.99 at Meijer. It's America's all-time #1 dice game with a Super Mario twist. Shake the dice in the custom block dice cup and watch the Super Mario icons fly. Will you roll a Large Straight with Coin, Red Mushroom, Fire Flower, Yoshi Egg and Star? Or will you roll five Green Shells? That's Yahtzee with a Super Mario twist. Game comes complete with a custom ? Block dice cup, 5 custom dice, score pad, rules and pencil.For 1 or more players, ages 8 and up. Packaged in a travel-sized cup that fits all components - perfect for trips to Mushroom Castle! NOTE: If you have a little girl, there's also a Hello Kitty Yahtzee game for $15.23!